Located in the middle of a mighty pond, this temple now hosts the 2nd largest Idol of Lord Vishnu in the world. 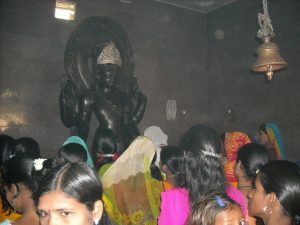 The idol was made of Black Granite during the Gupta period. A part of the Idol was always visible since many years on the banks of the same pond where this temple is now built in. But after mistaking it as a simple black stone for years, it was unearthed finally in 1992 to be found that it was the second largest Idol standing 7.5 feet high made in the historic times ( The largest one being the Idol of Lord Venkateshwara, standing 9 feet high, in the Balaji Temple, Tirupati, AP.) The people of the nearby villages of Saamas, Kutub Chak, etc. are religiously involved in making a great temple with the help of the State Govt and other agencies. 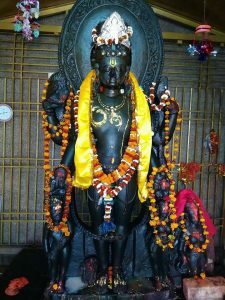 The idol is made of black granite and measures 7.5 feet in length and 3.5 feet in width. It belongs to the Pal period. Its four arms carry a “sankh (conch)”, a “chakra (discus)”, a “gada (club)” and a “padma (lotus)”.The idol has been installed in a makeshift temple on a sprawling 15-bigha campus of the tank. Samas village is located five km from Barbigha subdivision town and 25 km from Biharsharif. This village appears to be a great centre of iconography because a large number of idols have been recovered from here and its neighbouring regions in the recent years. Girihinda is situated 2 kms from Sheikhpura railway station and one and a half km off Eksari railway halt. It is very close to Budhauli Chowk where a big shopping complex exists.Transportation is available here. Ramadheen college is just 500 meters from here. District Board Dak Bangalow and Sub-divisional Hospital of Sheikhpura are located in this mohalla.